When you find a set of the best fine tip pens to use on your craft projects, you’ll wonder how you survived without them. They’re a necessity when it comes to details and thin lines. 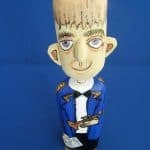 Whether you’re doodling in a scrapbook or an avid adult coloring book fanatic, writing or drawing with fine tip pen sets can make your good work look amazing. Fine tip pens for coloring in miniscule details can make your art work pop. Finding the best fine point pen might not be easy, but you’ll be ecstatic once you do. The felt tips of these pens make clear and crisp lines to express the tiniest of details. Imagine having a marker inside the body of a pen. This set of 10 slender pens with bold colors flow softly over notebook paper or thicker drawing paper. You can use these 0.38mm fine tip pens for coloring intricate patterns, writing in a journal, sketching, and any craft that requires concise lines. Bright colors glide onto various mediums without losing any vibrancy. The ink dries quickly and isn’t easily smudged. Just like a regular pen, the removable caps prevent dry-outs and fit on the opposite end when in use. They’re eco-friendly since the ink is acid-free, water-based, and non-toxic. Packaged in a cardboard box, they’re a nice addition to your supplies or a gift to a crafty friend. Drawing with fine tip pen sets lets you work with a firm hand while getting concise results. 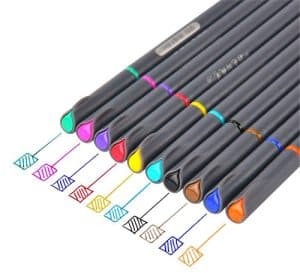 With 11 different colors plus five black pens, you can sketch portraits, technical drawings, add annotations, write notes, or make illustrations. 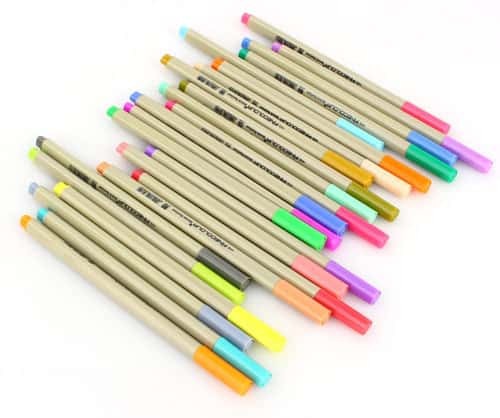 These highly pigmented colored pens have a 0.3mm nib while the blacks range from 0.25 to 0.5mm. Because each pen is filled with non-toxic, water-based, archival quality ink, it won’t smear, streak, or smudge. Plus, the ink is waterproof and fade resistant. For precision lines, a quick stroke of the pen is all it takes. The ink is bleed-resistant to most surfaces, so creating thicker lines won’t ruin your work. Caps are removable and snap back in place to prevent drying out. Tucked in a convenient plastic case, these ASTM-approved pens stay organized and secure. When you’re looking for the best fine tip pens for crafting, sometimes more is better. The fifty nine-pen set of basic colors lets you create your own variety of colors and shades with enough pens to last you plenty of creativity time. The acid-free, fade resistant ink is of archival quality meaning it’s made to last. 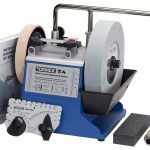 The bleed-resistant ink doesn’t smudge or feather which makes it perfect for a multitude of paper crafts, journal writing, scrapbooks, labeling, and more. 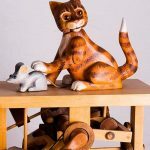 Each color of ink is composed of a single pigment that safeguards the color consistency. The 0.1 0.2 & 0.3mm tips are outstanding for making ultra-thin lines. A big set packed with quality. Possibly the best fine tip pens that mimic the look and feel of gel pens, this set is truly worth a look. Creating detailed line art, fine lettering, and using with stencils are just a few things this set of 24 pens can do. Flawless lines of non-toxic water-based ink erupt from the 0.3mm metal tip with each stroke. Don’t worry about smearing because the quick-drying ink stays put. 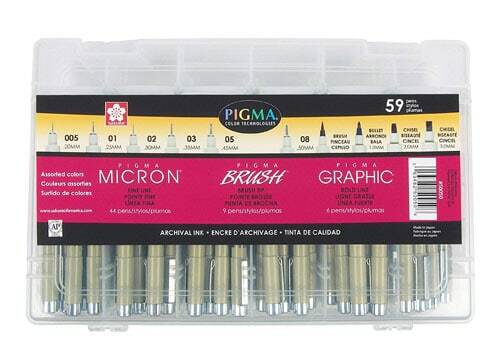 This may be the best fine tip markers for coloring those miniscule places other pens can’t reach. The triangular barrel fits nicely between your fingers to alleviate hand fatigue. Wrapped in a compact storage case, these pens are portable and ready to get to work when you are. This could be a set of the best fine tip pens for the crafter who wants it all. With 72 colors, there isn’t anything you couldn’t create. The 0.4mm tips of these pens deliver smooth yet fine lines in every color imaginable. 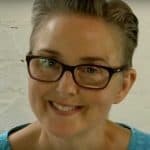 The non-toxic ink is water-based and can be used in coloring books, writing in notebooks, annotating photo albums, lettering wood, and more. Possibly one of the best extra fine point pens for any art project, they’re perfect for using with rulers, templates, and stencils. The fine points are made for super thin lines, but won’t give off a scratchy feel. Vibrant colors appear without smudging, bleeding, or fading. Packed in a transparent plastic case, you’ll love drawing with fine tip pen sets like this. Any art project could benefit from ink pens. All crafters should find the best fine tip pens that give you the power to create unique details every time. But how do you know what the best fine point pen is? That depends on the end result you’re trying to achieve. 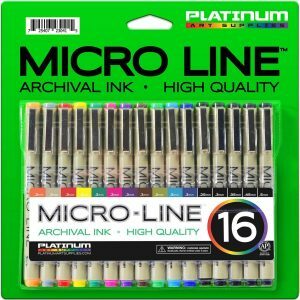 If you’re looking for the best extra fine point pens that you can use for a multitude of different projects? 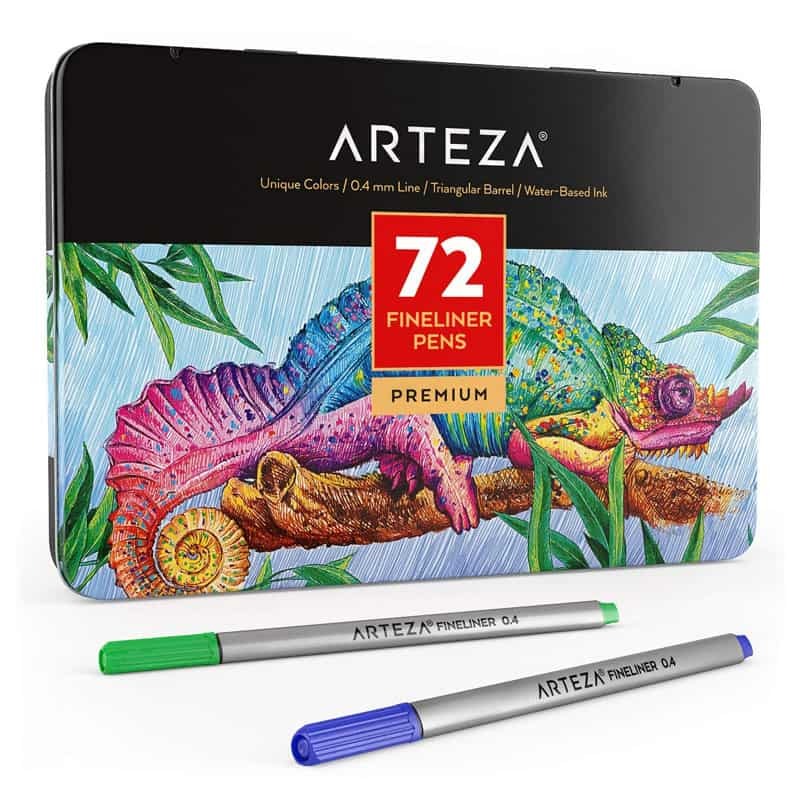 Try the Arteza 72 Fineliner Color Pen Set, Colored Fine Line Drawing Marker Pens. The versatility of these pens is amazing since the super-slim tips work well with other accessories like stencils and templates. You be the judge of which set works best for you.